According to the Sacramento Bee, 49ers rookie wide receiver Trent Taylor has stood out at OTAs and minicamp, and was reported as being “very good at separating” from defenders. Taylor is expected to challenge WR Jeremy Kerley for time in the slot this season. Taylor was one of college football’s best receivers last season, especially in the slot, where he lined up 95 percent of the time and led all college wide receivers in receptions (131) and receiving yards (1,734) from that alignment. 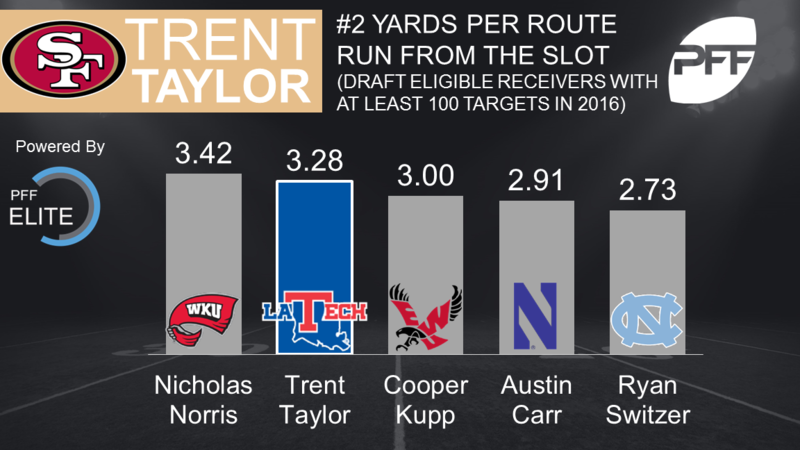 With 3.28 yards per route run from the slot, Taylor ranked second among draft-eligible wide receivers with a minimum of 100 targets. His catch rate of 80.4 in the slot tied for second among 72 draft-eligible wide receivers. He possibly had the best hands of the draft class, as his drop rate of 2.84 ranked first among draft-eligible wide receivers with at least 108 targets, only dropping four passes out of 141 catchable passes.